Dr Wojciechowski is a graduate of the University of Illinois and the Illinois College of Optometry. He is a member of the American Optometric Association, Oregon Optometric Physicians Association, and VOSH, a volunteer group that provides eyecare to people in underdeveloped countries. Dr. Scott Wojciechowski is joined in his practice by Kathy Pettit, Margaret Hinck, Jennifer Repp, Kate Polone & K.J. Teasley as his Optometric Assistants. 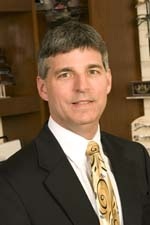 Dr. Derstine received his Doctorate of Optometry from the University of Alabama in 2000. For the past 12 years he has been providing comprehensive eye care at his practice in Clackamas. His areas of interest include contact lenses, ocular disease, and educating patients about preventative measures for maintaining healthy eyes over a lifetime. Dr. Derstine is committed to providing the highest level of care for his patients. His office is equipped with the latest technology in order to maintain this commitment. Dr. Derstine takes the time to listen to each patient’s specific needs in order to provide prescriptions and treatments that are personalized for their lifestyle. Kate has been with Moreland Vision Source since 2004 as an Optician. She is Certified Paraoptometric Assistant, and ABO Certified. Jen has been the Patient Care Specialist and Optician at Moreland Vision Source since 2003. She is a Certified Paraoptometric, and ABO Certified. Katie joined the Moreland Vision family in 2014. She is an Optometric Assistant and is a Certified Paraoptometric, performing preliminary testing for the Doctors. June is an Optometric Assistant, performing preliminary testing for the Doctors. Lindsey is Moreland Vision Front Desk Specialist. She will greet you with a friendly smile when you enter the office. Lillian is our Front Desk Specialist. Kathy is Moreland Vision's Bookkeeper and Insurance specialist.